As outlined in my previous post, I’d had a pretty terrible night’s sleep the previous night. So I felt rotten. To compound matters, the weather was rotten too. With breakfast at the campsite a no-go, we had to find an alternative option. Instead, we went to Cocoa Mountain, which a couple of people had recommended. This (hot) chocolate shop is located in Balnakeil Craft Village. The place has a very 1970s vibe — with good reason. That is because that’s when it was converted from a disused military camp. I couldn’t stomach any hot chocolate because I felt so unwell, and my cow’s milk intolerance means I have to avoid such drinks at the best of times. But Alex had a Mountain Mocha. This decadent hot chocolate looked incredible, with actual melted chocolate spilling down the sides of the mug. There was no better place for us to buy chocolate to take back to work. We opted for dark cranberry cashew chocolate. Very tasty. It was time to think about heading east, but not before stopping off at Smoo Cave, just at the exit of Durness. 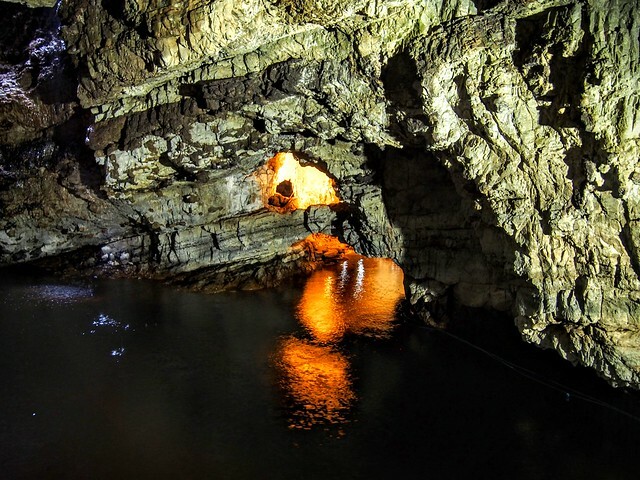 Yet another incredible natural wonder of the area, Smoo Cave is unusual because part of it has been formed by the sea, while another part has been formed by a stream coming from inland. There are three separate chambers in total, the middle of which is accessible by foot via a platform. 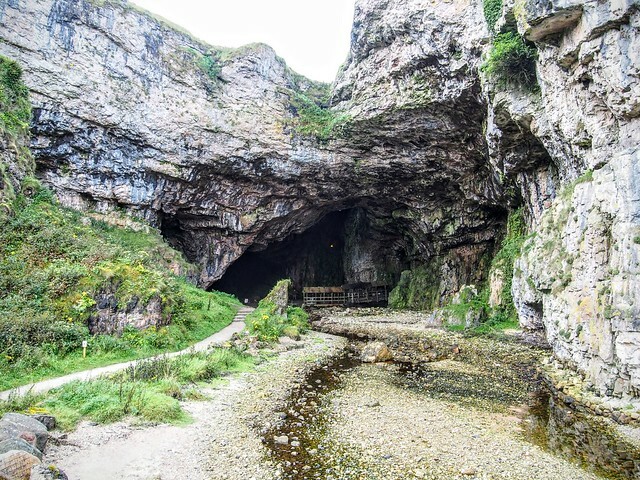 Meanwhile, the sea entrance is the biggest of any cave in Britain, at 15 metres high, 60 metres long and 40 metres wide. The cave is easily accessible, with a car park directly off the main road, and a pleasant circular walk down some steps to get down to the cave. However, you must be careful what you throw off the cliff edge. Our next stop was Bettyhill, around halfway between Durness and John O’Groats in terms of travel time. There, we visited the charming Strathnaver Museum, in the former parish church of St Columba. This is home to many artefacts and exhibits about the Highland clearances, Clan Mackay and agriculture in the local area — where people have lived for over 8,000 years. 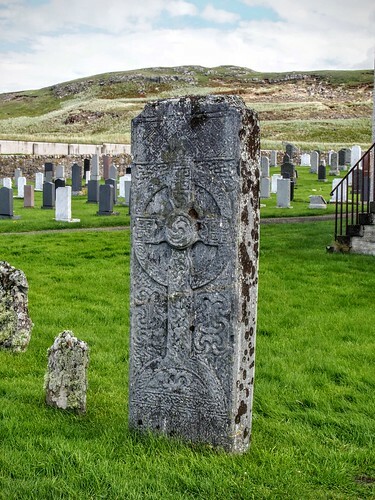 Outside the museum is the Farr Stone, a pictish slab thought to mark the grave of an important religious figure. Afterwards we took lunch in the Cafe at Bettyhill. We each had a bacon roll with a rather 1970s-looking salad. This was all very old fashioned, but it sustained us until our ultimate destination, which was now only a 90 minute drive away. This was our least favourite part of the North Coast 500 drive. By this stage we knew there was a good reason why the North Coast 500 had become a legendary road trip. But the extreme north east of the country is sadly not the most picturesque part. From Durness to John O’Groats in a day. A lot of people asked us why we had booked two nights in John O’Groats, given that it is famous for being so grim that it makes people want to go all the way to Land’s End to get away from it. It is true that the town feels like a missed opportunity of some sort. At times there are a lot of people there. But few go to John O’Groats as a destination. It is — and always has been — just a stopping off point for people. The town was originally created as a ferry port for Orkney. Since then, it has gained a reputation as a tourist trap. However, there are signs that the town is on the upswing. 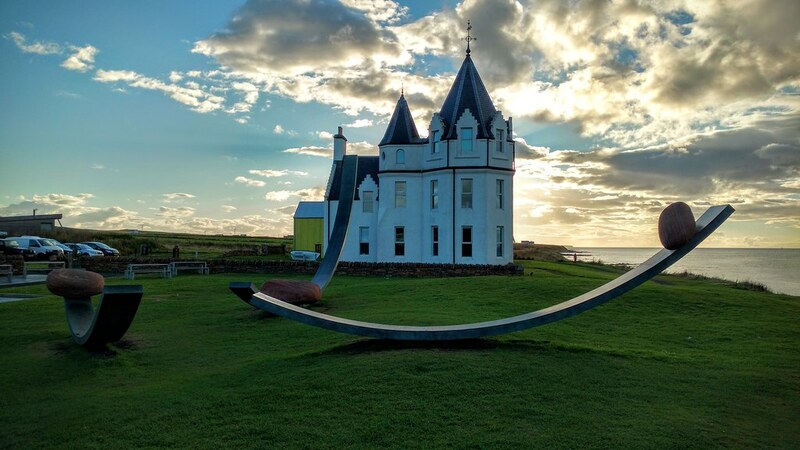 After decades of neglect, the striking former John O’Groats hotel has been restored. It is now self-catered accommodation. This is where we stayed for the two nights, and it was very nice. The sculpture outside is designed to represent the wildness of the Pentland firth, which has been known to throw rocks like this onto land. These attracted a lot of attention, like good public art should, with kids playing on them as if they were slides. There was little time to explore as the sun was setting. 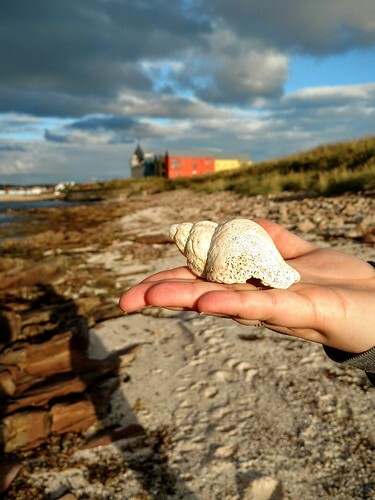 In the next post, find out what we explored around John O’Groats on the last full day of our North Coast 500 journey.